BMW’s new X3 design is well-suited to an urban environment. The sleek lines are very modern and with the long bonnet and low roof-line, the new X3 has an agile and athletic appearance. Attractive exterior detailing with plenty of chrome makes for an elegant medium-size SUV package from BMW. Underpinned with off-road AWD ability, the new 2017 BMW X3 is right-ready for some off-the-road action in the xDrive models. What are the new petrol versions like? Let’s take a closer look. BMW X3 Petrol versions are very smooth performers. If you need a long-legged SUV tourer with agile handling, a quiet interior, and plenty of luxury features, the petrol X3 versions might be the “bees knees”, particularly if you’re not needing heaps of large SUV space and added weight. Ride quality is first rate, and the BMW chassis team have worked hard to get the new X3 blending handling with refinement for an extra-satisfying drive. Smooth power delivery is a characteristic of all the petrol engines powering the latest generation X3. So what’s new? Actually a whole lot of stretching has gone on. The new BMW X3 is 60 mm longer, 10 mm wider and 1 mm taller than its predecessor. Also, the new X3 gains 54 mm in its wheelbase measurement too. Interior space has gotten bigger, and with the retention of the old X3’s high ground clearance, you’ve got some handy off-road clearance when traipsing off on a light off-road excursion. Appearance-wise, the third-generation X3 has a whole lot of subtle changes, and to many on-lookers the differences might not be that forthcoming to the eye. 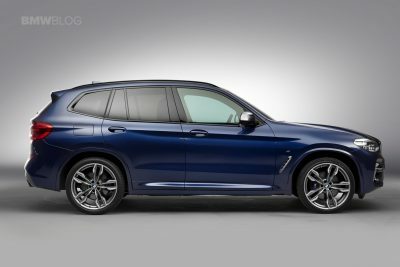 However, the 2017 X3 changes include things like larger dimensions, a windscreen with acoustic glass, LED headlights, an active engine air-flap control system, new LED fog lamps, new semi-autonomous driving assistance systems, an automatic tailgate with foot gesture, new LED rear lights with a 3D outline, twin exhaust outlets for all models and a new sports exhaust system for the new BMW X3 M40i. Yes, that’s’ for a new Motorsport version that has plenty of beans! Head into the interior and you’ll note a few things have changed. A new 10.2-inch touchscreen with gesture control comes standard (upgradable to a 12.3-inch one), more chrome trimmings, door pockets for 1-litre bottles and optional 3-zone climate air-conditioning system becomes available. Beautifully crafted textured leather seat options, an up-to-date Heads-Up Display and an even more off-road looking xLine trimmings are available where skid plates make an appearance for more off-roading orientated drivers. In case you weren’t sure, the xDrive X3 models come with true AWD ability, while other versions stick with the RWD set-up. Opting for the classier Luxury Line package takes out the matte-aluminium exterior trimmings and swaps these for classier chrome finishings, wood interior trims are part of the look, and ‘Luxury Line’ door sill finishers complete the comfortable interior expression. You can choose the M Sport package which will get you an M Aerodynamics body kit, alloy wheel designs of up to 21-inches in size, upgraded M Sport brakes and suspension, high-gloss black exterior highlighting, an M-steering wheel, ‘M Sport’ door sill plates and sportier M Sport seats. The xLine version gets a more off-road inspired look, with front and rear skid plates, matte-aluminium exterior trim highlights and ‘xLine’ sill trims. Starting with an output of 135 kW, the BMW X3 petrol range kicks off. 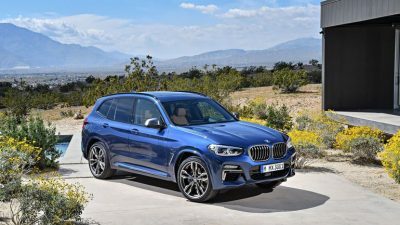 Known as the BMW X3 sDrive20i (RWD) and xDrive20i (AWD), these two entry models make a good fist of the performance on offer. Both are capable of sprinting from 0-100 km/h in a little over eight seconds and both can well exceed 200 km/h given the chance to do so. A handy 290 Nm of torque is available from the standard 2.0-litre turbo engine. More performance can be found if you drive the BMW X3 xDrive30i. Boasting a higher-output 2.0-litre turbo petrol-fed motor, this model has 185 kW of power on tap, and 350 Nm of torque available between 1450 and 4800rpm. On the road, the X3 xDrive30i is sharp and dynamic, while remaining comfortably refined whatever the road conditions. A 0- 100km/h dash can take just 6.3 seconds, and you can run on to a top speed of 240km/h. It’s also exciting to announce the arrival of the new BMW X3 M40i. Under the bonnet lies a 3.0-litre turbocharged straight-six, developing 265 kW of power and 500 Nm of torque. The full force of the torque can be felt at just 1520 rpm should the need arise, so this serves as a good kick in the pants enabling the vehicle to run a 0-100 km/h sprint time of less than 5 seconds. The top speed is limited to 250 km/h. All BMW X3 engines are coupled to an eight-speed ‘Steptronic’ automatic transmission as standard, and the marriage is excellent. Having said that the new X3 is a mid-size SUV, you can still put 550 litres of luggage in the boot space with the rear seats in place. Fold the seats flat, and the space grows to 1600 litres. With all the subtle new changes, new technology and refined, powerful petrol engines, the larger 3rd generation X3 now rivals the very good Volvo XC60 and equivalent Audi SUV models. Go and check it out! 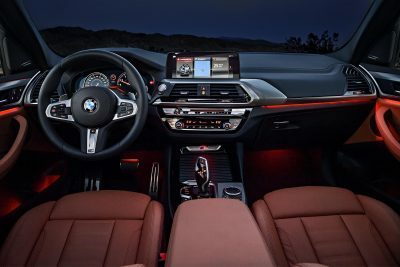 For any more information on the latest BMW X3 models or, for that matter, any other new car, contact one of our friendly consultants on 1300 303 181. If you’d like some fleet discount pricing (yes even for private buyers! ), we can submit vehicle quote requests out to our national network of BMW dealers and come back with pricing within 24 hours. Private Fleet – car buying made easy!